Google’s latest smartphone is getting very good response from the end users and expert reviewers! We are not away, the Google Nexus 5 is one of my every time favorite smartphone and currently my daily driver along with an iPhone 5S! I am not among the one who uses a case for this beautifully crafted device, but I changed my mind at least for the next few months after getting in touch with the Spigen Neo Hybrid case! On the other hand, screen protectors are very important to me as I do travel a lot and swipe through the screen almost every 10 minutes. I got the best in market and yes not one, but a bunch of 5 screenguards from MFX screen protectors. Let’s take a close look at both of them. Spigen products are always in line with the quality. The new cases from the company for the Nexus 5 are no other story. I have got the silver colored frame with the rubberized back materiel is top-notch and best out in the market. The cuts for the speakers, sensors are perfectly done. Unfortunately the 3.5 mm headphone port is sometimes not perfectly getting in touch with few headsets out there. The surprising thing is the inbuilt volume rockers and the power button, which blends with the original device buttons accurately. I bet you, people who are not aware about the Nexus 5 looks can’t realize that there is a case on your device. 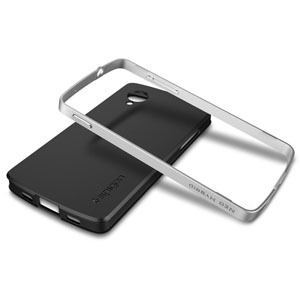 The Spigen Neo Hybrid cases are exact precision cutting to match with the Nexus 5 design. There are more colors available for the side frame such as Gold, red, grey, etc and you can change them with ease. 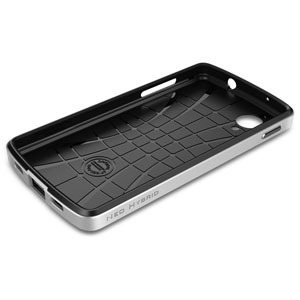 If you are a Nexus 5 user and need a case, go for this one without any further thinking. You can buy one from our sponsors MobileFun for just $27.99! The screen protector pack from MFX will definitely give you a surprise. 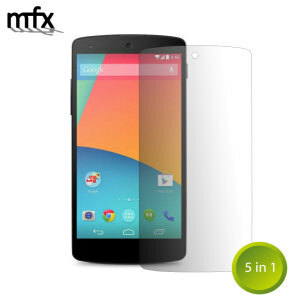 They are offering 5 beautiful, shining screen protectors for your Nexus 5 avoiding any kind of scratches on the beautiful display. The pack comes with 5 screen protectors, a cleaning material and an application card to remove the bubbles around. The cuts are perfect for the rounded ear-speakers and the device edges. Most importantly the MFX screen protectors are super thin that makes no sign of a screen guard on your device display. Go for this one if you want a safer Nexus 5! Purchase it from MobileFun for just $13.99! Mike V: Skateboard Party HD iPhone App Review – Be a Perfect Skater!